*NEW* The Heston Model in Matlab and C#. Foreword by Steven L. Heston, publication September 2013, John Wiley & Sons. Option Pricing Models and Volatility Using Excel/VBA + CD-Rom, published by John Wiley & Sons. Hedge Funds: Insights in Performance Measurement, Risk Analysis and Portfolio Allocation, published by John Wiley & Sons. Commodity Trading Advisors: Risk, Performance Analysis and Selection, published by John Wiley & Sons. Performance Evaluation of Hedge Funds: A Quantitative Approach, published by Beard Books. Hedge Funds Risk Assessment, Analysis and Returns, published by Beard Books. Dr Rouah is a former Faculty Lecturer and Consulting Statistician in the Department of Mathematics and Statistics, McGill University. Before joining Sapient he was Vice President at State Street Bank in Boston, MA. 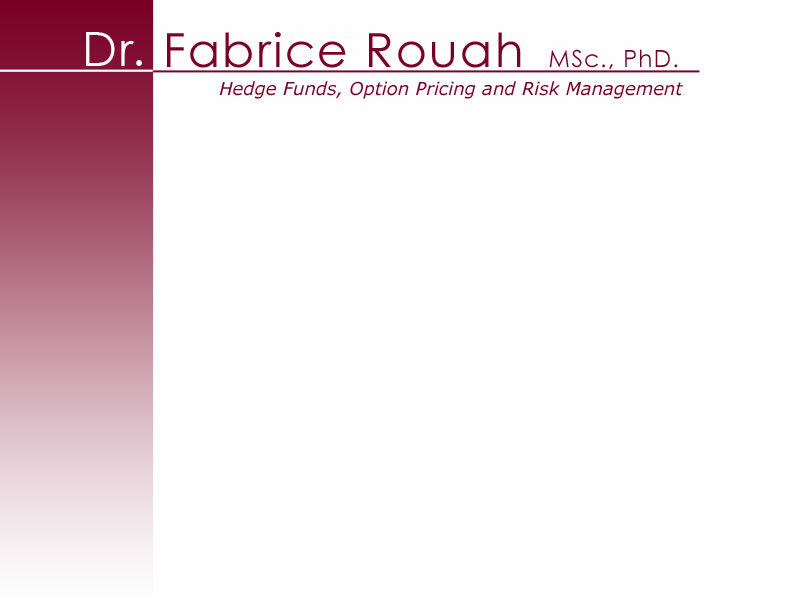 His research has been published in journals such as Journal of Futures Markets, Journal of Alternative Investments, Journal of Derivatives & Hedge Funds, Journal of Wealth Management and others.